An investigation into what led to the in-flight breakup of an F-15C Eagle fighter in November 2007 uncovered structural beams in several aircraft that weren't up to spec, US Air Force officials said Thursday. Investigators also discovered one of the accident aircraft's four cockpit longerons, which support the fuselage during high-g maneuvers, was thinner that design specifications called for. Colonel William Wignall, head of the USAF team that investigated the accident, confirmed the upper right longeron on the Missouri ANG aircraft had manufacturing defects. That longeron cracked apart under the stress of a 7G turn, the colonel said, leading to the other longerons failing as well, which then caused the cockpit to separate from the rest of the fuselage. The pilot was able to eject from the cockpit, but suffered a broken arm when the canopy snapped off. Subsequent inspections of other F-15s throughout the USAF fleet have uncovered a wide range of issues with other longerons -- including those that are too thin, or have surface imperfections that may place too much stress on the structure. The flaws on some beams are relatively minor; others have larger problems, reports The Los Angeles Times. Nine other F-15s have been found to have cracks in their longerons, similar to those found on the accident aircraft. The incident led to the grounding of the Air Force's F-15 fleet. As of January 9, the Air Force approved 60 percent of F-15 A through D models to return to service with no flight restrictions, though inspections continue on other planes. Problems have been found on F-15s built between 1979 and 1985. Air Force officials want answers on how, and why, apparently substandard structural parts were used to build what at the time was the USAF's front-line fighter aircraft. Trouble is, it's hard to say where the process broke down. No one source of the problem can be isolated, said General John D.W. Corley, the commander of Air Combat Command. "This isn't just about one pilot in one aircraft with one bad part," Corley said. "I have a fleet that is 100 percent fatigued, and 40 percent of that has bad parts. The long-term future of the F-15 is in question. "Don't lose sight of the fact this is not just a bad part, it is a bad part that has been under stress for 25, 26, 27 years," Corley added. "It is the interaction between the fatigue, stress and that part that causes the crack." 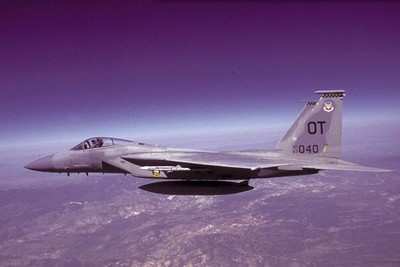 The F-15C involved in the November 2 accident was manufactured in 1980, by McDonnell Douglas. Boeing purchased that planemaker in 1997, and assumed production of the Eagle at that time. It's unclear whether Boeing will be held liable for the structural problems. "We've had great involvement from Boeing during the investigation," Wignall said. "In fact, they're the ones who determined the longeron was the problem. This was then confirmed by the Air Force Research Laboratory." 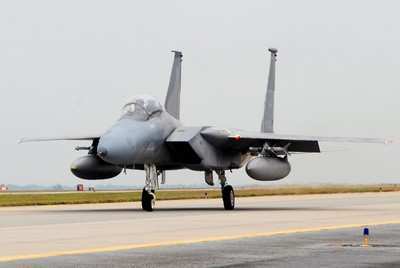 A Boeing spokeswoman wouldn't comment on the findings, saying the company is awaiting word on the roughly 180 F-15s that remain grounded. As ANN reported earlier this week, those aircraft may be grounded permanently. The F-15 was originally life-limited to 4,000 flight hours when it entered service in the mid-1970s. Subsequent testing by McDonnell Douglas validated the aircraft could safely fly for twice that time, and the limit was raised to 8,000 hours. The accident F-15C had 6,000 flight hours, according to the Times. The newest F-15, the -E Strike Eagle, is life-limited to 16,000 flight hours.